It’s hard to go wrong with grilled potato covered in melted cheese. Slice up a potato, lay them out on a greased casserole dish and cover with slices of cheddar cheese. 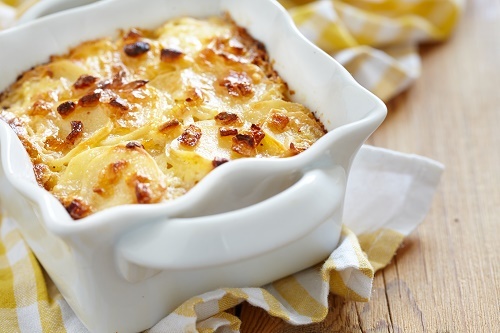 Dust the cheese with flour, salt and pepper, and pour a cup of skim milk over the potatoes. The dish goes into an oven preheated to 350°F. Your potatoes will be crispy and cheesy in about 45 minutes.